Frameless glass doors, also known as glass curtains are an innovative new product range of retractable door systems. Available in a single glazed and double glazed specification the applications are endless. The single glazed varient of the design can be used for various purporses, including room dividers, balcony doors, mehrandas's and shop fronts. 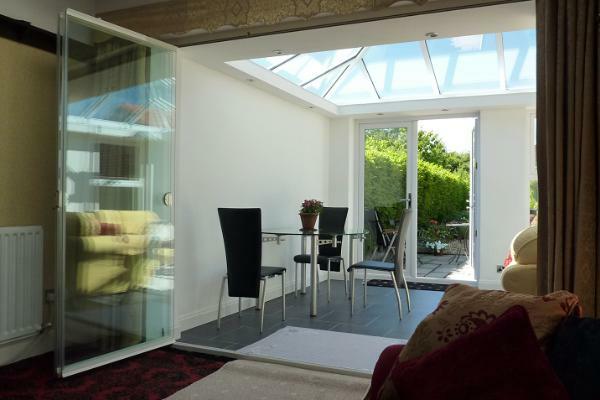 They are completely frameless, fully retractable and come with a variety of optional extras. Whether it's a balcony, terrace, patio door or room divider the single glazed glass curtain is soon becoming the alternative to bulky bi-folds and folding sliding patio doors. Installation and site survey are of course standard, and included in all quoted prices. Built into the Frameless Glass Door is a standard access door, which can be used exacvtly the same as a traditional patio door, therefore giving you greater ease of access. In addition to this, the latest arrival to the frameless glass door range is the double glazed system which attains efficient heat retention and a lower U-value rating. In doing so it meets UK building regulations and weather testing requirements for all external purposes. There are many Bifold Door companies out there, so why choose us? The reason is simple, many of these companies do not manufacture their own product. We were one of the first companies in Europe to design and manufacture the Aluminium Folding Sliding Door system, and this leads to many benefits for the end user. All our frameless glass doors and bifold doors are manufactured at our head production facility in Luton, Bedfordshire. We also powder coat all of our products 'in house' which means we can offer a quicker turn around time, lower costs and a bigger variety of colour options. As we design and manufacture all of our door systems in house every door system is made to measure. This also means that if problems do arise, our trained installers and fabricators are on hand with the know how to solve the problem as quickly as possible.